Management models – you love em or hate em. I need to deal with these at work. Whilst watching a match on television, I started wondering how this is applied to football. Well I dont work in a football club so I will attempt to draw some plan. Management failures typically have some root cause in business management models, the challenge as always is trying to find the cause. Lets take a look at Roy Hodgson’s days at Liverpool His failure at Liverpool coming hot on the heels of the arrival of Damian Comolli was met with shock the former England manager. He didnt last long with the new Director of Football Strategy. Comolli was intent on building for the future whilst Hodgson was worried about the here and now. Their inability to communicate effectively wasn’t the only problem. Comolli brought in a string of players, including Luis Suarez, Andy Carrol, and a whole bunch of others such as Charlie Adam, Stuart Downing and Doni, to name a few. In April of 2012 , Comolli left by mutual consent, many believe it was the lack of communication between management and playing staff that led to this and his forays into the transfer market. Liverpool was essentially in turmoil during those days. They had to bring in Kenny Dalglish to the club, but failed to address other issues during his reign, many cite failing to handle Luis Suarez as a possible root cause. Finally with Brendan Rodgers at the helm, their failure to sign a striker before sending Carrol on loan finally underpinned how poorly senior management there handle club affairs. A cursory search on Bing for management models in football drew this article from the Oregon Youth Soccer Organisation for referees. 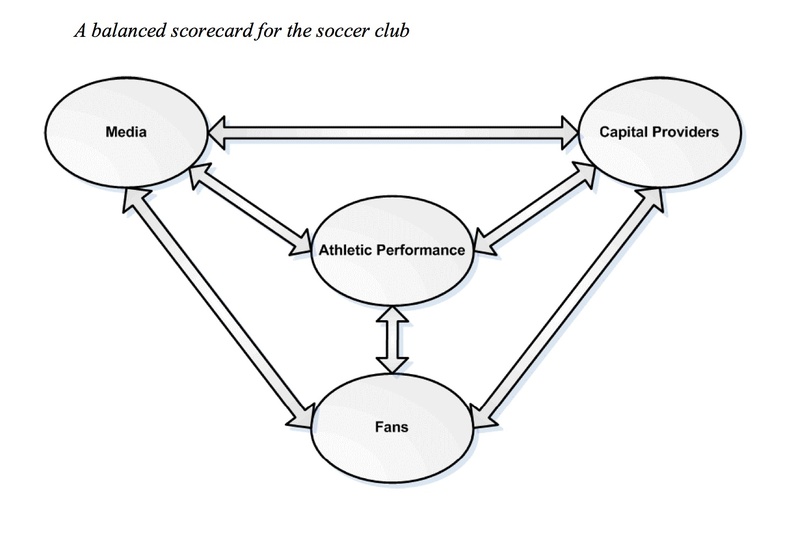 And out of Greece, we have this Soccer Scorecard (its a pdf document where they explain their model)which takes the Balanced Scorecard (BSC) developed by Kaplan and Norton and adapts it for football organisations. The BSC focuses on traditional indicators purely based on past performance as its metrics. 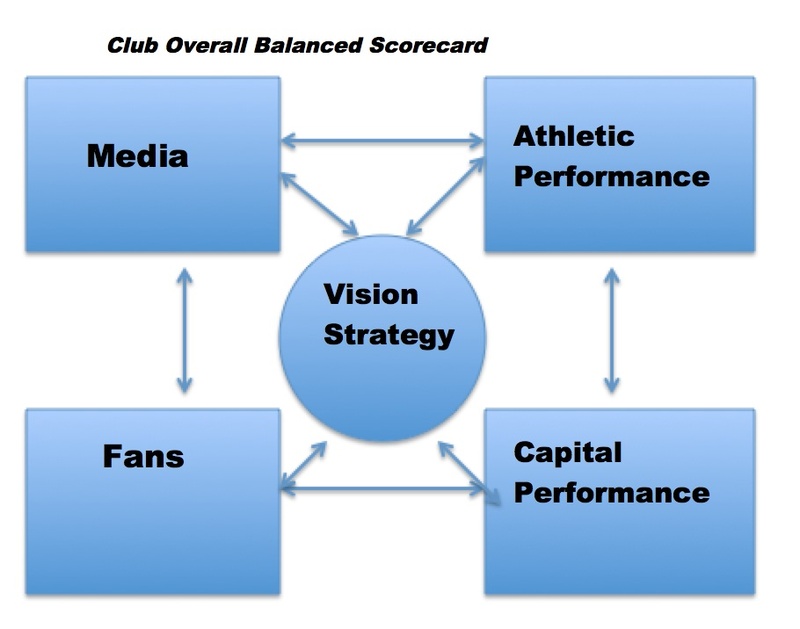 Its a top-down method for defining an organisations goals and objectives and lines them up with the vision of the club. Its then used to monitor how the organisation performs and if needed take corrective actions. In business organisations we stick our indicators into 4 main quadrants which are : Financial Performance, Internal Business Processes, Customer Perceptions and Learning & Growth. It defines its success factors from within these four categories, senior management then assess where they stand vs the overall objectives of the company. Scorecards like these are continuously monitored because organisations grow over time, and objectives need to be reassessed. And organisation in its early days could be more focused on developing a market, its priorities will be different from an organisation thats already been in the market for the last 10 years. We cant use the balanced scorecard to evaluate past performance, its used to identify how we can achieve our objectives by understanding past performance. The challenge of using BSC analysis is that it isnt easy to find a correctly balanced set of performance indicators. There is usually little consensus in a company’s management team regarding these indicators. In addition, the main indicators have to be broken down into underlying indicators that can be acted upon down the line. Otherwise employees end up just focusing on the main ones. I have been using the BSC for a while now at work, I have also used Root Cause Analysis a lot to determine the reason why a certain task can’t be completed or why a certain project has failed to take off. And this is where me and the Greeks depart company. This is as far as they went, but they failed to take into account the overall strategy of the club. This has to be included within the framework. In my model I’ve included strategy and vision for the club, because these are the ones that need to be driven across the organisation. In football manager parlance, I plan to take Stafford Rangers and model them according to these principles. My Strategy is to use young players to become promotion candidates within the first season. I will be judging their performance through a series of indicators such as tangible metrics such as average ratings in matches, performances in training and player attributes. Their overall training programmes will be assessed to see if there is major training improvement in all areas. Feedback from coaches will be used to see who is progressing and who isn’t players who fail to achieve satisfactory coaching reports will be counselled. Communication channels will be maintained and monitored between me the fans and senior management. As long as I keep my whole team aligned towards achieving my strategy we should do fine. Our training performances and match performances will be gauged by the fans. We want the fans confidence in us to grow and we will be using ingame indicators such as fan attendance to assess how well we are doing. We will also be paying attention to fan reactions after matches. Media management will also be done judiciously, we will approach the media in a calm fashion to show that the club is being managed well. We will engage in mind battles with other managers before and after matches to unsettle their team. Our media rating will be observed and assessed. We also want to see how the players react to us when we speak about them in the media. To do so i need to earn the confidence of the players. Playing as a Sunday league footballer this should be the lowest level, so its an uphill climb. In as far as Capital Performance is concerned, we shall endeavour to wheel and deal in the market. Our primary objective is to achieve a playoff berth whilst having a strong bank book. In my next blog I plan to do a detailed BSC for assessing athletic performance in matches and during training. I will also try to use Root Cause Analysis to ascertain why we aren’t performing in matches and to see which area of our game is doing poorly, and how I may go on to handle them. I don’t know what most of this means but it seems an intelligent and well-informed way to go about it. Will read through a few times to try and get my head round it! Great to see this sort of thing in the community.